College is a time for more than just exercising your brain with new knowledge and skills; it is also a time for meeting new people and creating memories. Students around the country alleviate their scholastic stresses by visiting nearby taverns and night clubs. From traditional college bars to unique and historic establishments, there are many different places for student to hang out. Each region and university has its culture and environment, which is enhanced by favorite hot spots and local bars. Traditional college bar activities include beer pong, darts, pool, and karaoke. At trendy night clubs, students dance to live music or hot, new DJs. Some scholars are simply looking for a casual atmosphere with cold beer and great food. Regardless of your particular desire, there are bars and clubs for all personalities and pocket books. 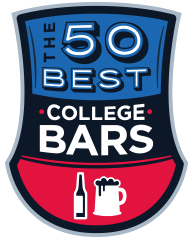 These are our 50 best college bars in America. Let us know what you think in the comments. The Tombs restaurant and bar is an impressive old spot established in 1962 for Georgetown University students and faculty members to stop by for a reasonably priced list of menu items like pork belly steamed buns, poutine, calamari, artichoke dip with crab, and nachos. With an excellent list of food items, visitors are also welcome to enjoy its full bar and cocktails. On Sundays, The Tombs hosts live music events. The Tombs has up to fifteen hours of happy hour per week, twenty different beers to choose from, and the occasional college game night. Overall, though, the Tombs is mostly an atmosphere for friendly and light catch up over food and drinks. It is also family friendly. The University of Oregon in Eugene, OR loves to visit the Growler U for its excellent pub vibe. They offer a beer of the day drink special that costs only $2.50. They have up to twenty hours of happy hour per week, and up to forty different selections of beers to choose from. They occasionally host live entertainment and college game night. But it’s ideal for catching up with brews with friends. Colorado State University students visit the Town Pump for its dive bar atmosphere, its twenty-one hours of happy hour, sixteen different selections of beers, and occasional live entertainment. They often host college game nights for those looking to catch up on their college basketball or football game. The Town Pump has a juke box for music, a full bar, and outdoor patio area for smokers. The bar does not accept any major credit cards, but they do have an ATM indoors. Students of the University of Iowa love the Deadwood Tavern for its dive bar atmosphere, juke box, full bar, and classic vibe. The Deadwood Tavern does not accept credit cards, but it does host up to fifteen hours of happy hour per week and offers twenty-four different beers to choose from. They very rarely host live entertainment or game night but frequently have the TV on for those looking to catch up on their college football and basketball games. The Deadwood Tavern has a little something for everyone including an air hockey table. For some properly mixed whiskey sours, the Deadwood Tavern is the place to be. West Virginia University has an excellent college bar to visit called Mario’s Fishbowl. Mario’s Fishbowl is frequented not only for its excellent bar and drink specials, but also for its great menu of bar food items like wings, burgers, hot dogs, but also for its excellent Brunch menu, including salads, sandwiches, breakfast fajitas, and the amazing chicken and waffle combo. They also have tater tots that come with drizzled Sriracha sauce. With up to twenty-eight hours of happy hour, twenty different beers to choose from, it’s a great place to enjoy not only food and drinks but to catch up with good company. If family visits from out of town, Mario’s Fishbowl would welcome them with open arms. Mario’s Fishbowl does not host any major events or live entertainment, but for those looking to catch up on the college games, they do have a TV screen for viewing. University of Florida’s student body frequents The Midnight in Gainesville for its reasonably priced bar menu items such as homemade chili, sandwiches—including a peanut butter and jelly or peanut butter and nutella—hot dogs, and sides. They have up to twenty different beers to choose from, twenty-five hours of happy hour per week to enjoy, and live entertainment and games. The Midnight is not the ideal place to catch up on your college games, but it does have a great menu and bar to enjoy. It’s an excellent place to catch up with friends or decompress while enjoying a few beers. O’Bannon’s Taphouse is Texas A&M University’s go-to spot for beer tours, drink specials ($2.00 wells), and $1.00 discount on all drafts from Monday through Sunday. They have a great selection of not only beers but also whiskey and scotch. They host up to thirty-six hours of happy hour per week and offer a whopping seventy-five selection of different beers to choose from. They occasionally do host some live entertainment, but for those seeking to catch up with their games, O’Bannon’s is a good place to be. O’Bannon’s doesn’t have a food menu, but their large selection of beers to choose from, including a creamy Guinness, who needs food, anyway? The University of South Dakota’s student body loves Vermillion’s own Carey’s Bar, established in 1954. Carey’s offers drink specials Monday through Friday, with up to twenty hours of happy hour per week and twenty-five different selections of beers to choose from. They don’t host any live events or games, but they do have a TV/sports package for those looking to catch the latest college football or basketball game. They don’t have much of a food menu, but for those looking to host a private party or event, Carey’s is the place to be. Zeno’s Pub is Penn State University’s favorite place for beers and music. Every week there is live music playing at Zeno’s for people to enjoy with their creamy Guinness. They have up to twelve hours of happy hour per week, twenty-four different selections of beers to choose from, and TV/sports packages for those looking to catch the college basketball or football game. It’s a great bar for beer lovers, and those looking to pair it with a delightful soft pretzel. Ken’s Tavern is Florida State University’s favorite college bar with its drink specials that last all week, twenty hours of happy hour, eighteen different selections of beers to choose from, and live entertainment nights. Ken’s Tavern also hosts TV and sports packages for those looking to catch the latest college football or basketball game. Ken’s Tavern is known for its sake bombs, beer pitchers, and darts. Students at the University of Scranton frequent the Bog for its casual bar atmosphere, good drinks and good fun. The Bog hosts live entertainment and music by local bands. The Bog doesn’t have any happy hours, but it does have up to thirty-four different selections of brews to choose from. They also have TV for those looking to catch the latest college football or basketball game. The Bog also hosts trivia night on Thursdays for those looking to have some fun over a few beers. Xavier University students of Cincinnati, Ohio frequent Dana’s bar for its dive atmosphere, and casual environment to enjoy a few brews and a few bites of decent bar food when hunger strikes. It hosts up to twenty-eight hours of happy hour per week, has up to ten different selections of beers, and TV/sports package deals for those looking to catch the latest college basketball or football game. Xavier University is also well aware of Dana’s bar scene and lists it on its website as a resource for those in search of a night life. Students at the University of Colorado have it made with the Mountain Sun Pub. Mountain Sun offers not only impressive drinks like a Colorado Kind Ale or the Blackberry Wheat beer, but it also has an extremely impressive food menu that is made from local farmer’s ingredients. There are healthy soups and salads to choose from, as well as sandwiches and house specialties that also cater to the vegetarian diet. For hearty, savory meat eaters, Mountain Sun has you covered with its wide selection of different types of burgers. Mountain Sun hosts up to twenty hours of happy hour per week and has up to sixty different types of brews to choose from. Mountain Sun also hosts game and live entertainment, but if you’re looking for a place to catch the game, you better try elsewhere. Libby’s Bar and Grill is the go-to spot for students of the University of New Hampshire in Durham. It hosts up to nine hours of happy hour per week, offers fifteen different selections of beers, live entertainment, music and games, as well as TV and sports packages for those looking to catch up on the latest college football or basketball game. Libby’s Bar and Grill has an excellent food menu with nachos, spinach dip, waffle fries, chicken wings, quesadillas, soups, salads, and, of course, burgers. Libby’s Bar and Grill also has a great selection of wraps and sandwiches for those looking for something during lunch hours. For a date night, Libby’s also has students covered. They have choices like the lobster mac and cheese, sirloin, Alfredo chicken pasta, fish and chips, and eggplant parm. Libby’s also transforms in the late night hours for those seeking a place with a nightlife. From 9PM to close every Thursday through Saturday, Libby’s is a dance club with live music and laster light-show. Kilroy’s is the University of Indianapolis’ favorite spot to visit downtown for its drink specials that last from Monday through Sunday. They also have a great selection of various appetizers that are great for pairing with drinks like stuffed breadsticks, chicken tenders, mozzarella sticks, quesadillas, BBQ nachos, sliders, Cajun chips, tacos, sampler platters, salads, wraps, sandwiches, pizza and rib entrees. Kilroy’s offers an impressive fifty hours of happy hour per week and a beer selection of twenty different varieties. It does not host any live music, entertainment or events, but it does offer a TV and sports package. Knight Library is the University of Central Florida’s go-to spot for great drink deals blended with casual fun, games and events like Saturday’s $1 shot, $1 bottled beer and free drinks and free drafts for singles hosted by live music spun by a DJ. Ultimately, the Knight Library is more a place for those seeking nightlife. They host up to twenty-one hours of happy hour per week, have up to fifteen different selections of beers, they frequently have games and live entertainment on site and they do have some evenings where they host a sports night for those looking to support their college basketball and football teams. The University of Arkansas campus calls their most beloved bar: Sideways. Located in Fayetteville, Arkansas, Sideways offers a full bar, draft brews, twelve hours of happy hour per week, and up to 150 different selections of beers. Sideways also hosts live entertainment and games, as well as TV and sports package deals for those looking to catch their home team on the latest college basketball or football game. Sideways is also well-known for its carefully crafted cocktails as well as its student-budget-wary pricing. The Baxter is frequented by students of North Carolina State University for its dive atmosphere, arcade, and vintage charm. For those comic nerds, the Baxter also has some comic books and video games for people to enjoy. It is the ultimate spot for the game loving crowd who has a special place in their hearts for the likes of Donkey Kong and Space Invaders. The nice thing about the Baxter is also its convenience. For those showing up without quarters to spend, they provide quarters from the register and ring you up right on your tab where you also have your beers. For those who were wondering where all the bottles of Surge went, the Baxter has Surge for non-drinkers! They mix it up into a cocktail called “She-Hulk.” The Baxter has twenty-five different selections of brews to choose from. They also have live entertainment and games. It’s not the ideal spot for dinner, but they do have some sports and TV packages for those looking to catch up on their basketball and college football games. But this is the kind of bar that most comic and video game appreciators might enjoy. Baton Rouge’s favorite spot for Louisiana State University students is Slinky’s bar. It’s a relaxed atmosphere with a pool table, jukebox, beers on tap and a full bar. Slinky’s has eighteen different beer selections, game nights, live entertainment, as well as TV and sports packages for those looking to catch their home team on screen for the latest college basketball or football game. Slinky’s is a classic dive, and not known for any food options. But it is the go-to spot for catching up with friends with a drink. Ohio State University’s finest drinking spot is the Thirsty Scholar bar. It is heralded for its full bar, specialty cocktails, and being the best bar in town to catch the college basketball and football games. Not only does the Thirsty Scholar have sports packages and deals, it also offers game and Karaoke night for students to come and decompress with. The Thirsty Scholar understands Ohio State University students’ college budget living, so the spot is adored for its reasonably priced drinks. It is so much a place that is embraced by the student body that the Ohio State University website lists it as a resource for the academic community. Kansas State’s favorite aunt’s place is Auntie Mae’s. Kansas State University visits Auntie Mae’s offers great bar food like chicken strips and fries, but it also has a special event every night including trivia, bingo, and open mic comedy. During baseball season, Auntie Mae’s offers the Royals drink special during baseball season with pints priced at $1.50. Auntie Mae’s offers fifteen different types of beers and up to fifteen hours of happy hour per week. Auntie Mae’s TV and sports packages are loved by the Kansas State University academic community that comes out to support its home team watching college basketball and football team. Columbia, South Carolina’s go-to spot is the Whig. It is embraced by the University of South Carolina’s student body and faculty for its casual dive atmosphere, drink specials, and reasonably priced bar menu. The Whig has taco Tuesdays, sweet potato fries, mac and cheese, and chicken and waffles. They offer a great selection of beers on tap, ranging up to twenty-eight different kinds. They have live music, trivia night, games and Karaoke for those looking for some excellent entertainment. They also offer up to twenty-one hours of happy hour per week. For those looking to catch up on their college basketball and football games, the Whig has them covered. The Whig has great food and its many great food reviews on Yelp help attest to that claim. The University of Michigan’s favorite spot to drink and catch up with friends is Ann Arbor’s Ashley’s. Ashley’s has a great selection of hot sandwiches and wraps, fries, burgers, soups, salads, and specialty dishes like fish and chips, mac and cheese, chicken pasta, and fish tacos. For those looking to have the full-on three-course meal, Ashley’s makes it possible by also offering desserts like a root beer float, sundae, torte, stout beer float, and caramel apple “eggroll.” Ashley’s has a wide selection of draft beers ranging up to thirty-five. It also hosts fifteen hours of happy hour per week, as well as bar games, trivia, live entertainment and TV and sports packages for those looking to catch the college basketball or football game. Hemingway’s Café is Pittsburgh University’s go-to spot to catch live music, pub trivia, and Karaoke. Hemingway’s Café has an eclectic selection in its bar menu, including pot stickers, pierogies, cardiac stix, pita chips, wings, nachos, fries, pretzels and chicken tenders. They also have hummus, pizza, Mexican food and steak salads, making it the ultimate American dining experience to enjoy while listening to your local live DJ spin. Hemingway’s is closed on Sundays, but from Monday through Saturday, they have bar specials like $2 Miller Lite drafts or $5 pitchers. Hemingway’s Café has been voted the best bar food, best karaoke, best specials and top college bar by various press coverage, including the Thrillist and The Business Insider. They have thirty-six different types of beers to choose from the draft, twenty-four hours of happy hour, as well as TV and sports packages for those looking to catch the college basketball or football game. Howard University in Washington, DC loves the Bravo Bar. Not only does the Bravo Bar have up to 21 hours of happy hour per week, but they also offer fourteen different selections of beer, as well as game night and TV/sports packages. Bravo Bar is also embraced for its excellent bar foods. With its full bar capable of any cocktail that a patron might desire, they also have great burgers, fries, cheesesteak, wings, hot dog and other snacks to enjoy while catching the college football or basketball game. Their pints are priced at an average of $4. The Bravo Bar is not only a great place for college students, but it’s a local keep that the neighborhood loves to stop by and catch up at. The University of Kansas in Lawrence is lucky to have the Wagon Wheel bar and café for not only its great, drinks and pizzas, but also for its amazing commitment to the community to boost and empower the younger generation. The Wagon Wheel is not only a dive bar that entertains the academic community with cheap drinks during happy hour that cost $2 a pop, but they also give out pizza slices for folks who stick around to closing time for just $1. With its charming, nostalgic atmosphere, both students and locals who were once students have an ambiance to appreciate when they pop into the Wagon Wheel. The bar has a great juke box for those looking to listen to some tunes old school style. The bar also has twenty-five different selections of beers, live entertainment and TV and sports packages for those looking to catch the college basketball or football game. Ball State University students love the Chug. Those living in the local Muncie, Indiana area are just as familiar with the Chug for its pool tables, dancing, drink specials, Karaoke, and live music. With a full bar, fifteen different types of brews to choose from, twenty-eight hours of happy hour per week and sports packages, the Chug is a favorite among the local crowd for its fun and entertainment. For those looking to host a special event or a party, the Chug also offers event space. The Chug also hosts fun fundraising gigs, the most recent one being for breast cancer awareness. San Diego State’s Effin’s Pub and Grill is a favorite among those seeking an “effin” good time. They have decently priced select domestic beers. For the San Diego State University students looking for the right bar to root for their home team during college football and basketball games, Effin’s Pub and Grill offers sports packages that are modestly priced for students on a budget. Not only that, but they also host baseball games during the baseball season. For those watching hockey, Effin’s Pub and Grill also has you covered. Effin’s Pub and Grill also offers party booking deals for anyone looking to host a birthday, graduation, or bachelor’s party. Their website conveniently has a fill out sheet for those looking to get information right away. Effin’s Pub and Grill has twenty-four types of beers, bar games and trivia, and sports. It has all the things that you want from a sports bar and pub. Knoxville, Tennessee has an excellent pub that’s right for students at the University of Tennessee looking for the right brew in the right season. The Half Barrel offers $2.50 margaritas in the summer season and Saturday college game nights for those looking to catch college basketball and football. They specialize in American bistro style foods as well as special deals on bourbon and draft beer selections, ranging up to twenty-three different kinds. The Half Barrel is the right kind of place for those in search of a fun atmosphere to watch games, a decent spot to knock back some beers and chat and catch up with friends. They host at least one night of live entertainment such as music or bar games, and they offer sports packages for those looking to root for home of the Bluetick Coonhound—Smokey the mascot. Miami, Ohio’s favorite restaurant saloon, and sports bar is Mac and Joe’s. Having been around since 1946, Mac and Joe’s is considered the local’s favorite and oldest restaurant and bar in the area. Located in Uptown Oxford Ohio, it’s the place to be among residents and local college students looking for a bite on a budget, and a drink to wash it down with. The bar menu includes ten-ounce steak burgers of all different styles and flavors for under $10. They have a generous selection of sandwiches that come with fries or tater tots. Of course, they also serve bar foods like wings, nacho and all types of fries with dip. With twenty-one hours of happy hour per week, fifteen different types of beers to choose from, Mac and Joe’s has your cravings covered. Although they do not host live events or bar trivia, they do offer sports deals and packages for all your college football and basketball games to enjoy a snack and some brews. Blacksburg, Virginia’s go-to spot for students of Virginia Tech is the Rivermill Bar and Grill. This restaurant is a Tex-Mex restaurant that blends burgers, beers, and nightlife all in one spot. They have fourteen hours of happy hour per week and serve 36 different selections of beer from the tap, bottle and can. They have trivia night and bar games for those seeking some communal entertainment, as well as sports packages for those seeking a place to watch their college basketball and football games. For those looking for the best place relax, enjoy a bite in a casual atmosphere, and talk through the night (open till 2 AM), the Rivermill Bar and Grill is the place to be. Omaha, Nebraska’s own Tracks Lounge is a host to many University of Nebraska students. Famous for its $5.00 Bloody Mary cocktails, its amazing jumbo chicken wings, chili cheese fries, fry baskets, cheese curds, mac and cheese bites–its amazing range of appetizers will have students coming back for more bar food to wash down with its thirty-three different selections of beer and full bar of spirits. As many college students might love, the Tracks Lounge also offers an amazing selection of wraps and sandwiches made from prime rib and caramelized onions. For that special college student budget, the Tracks Lounge offers an excellent $5.99 deal from Monday through Friday between 11AM and 2PM for a cheeseburger and any choice of sides. This is a deal that’s cheaper than what some fast food restaurants charge. Lexington, Kentucky’s local university spirit comes together at the Two Keys Tavern, which has been a fixture in the local scene since 1936. The tavern offers specials on pint and well drinks, live music from local bands on Fridays without charging a cover to college students on a budget, and thirty different beers to choose from depending on the person’s mood. It hosts thirty-six hours of happy hour per week, as well as live events and sports nights for its local college basketball and football enthusiasts. The Coug Pullman of Washington is a favorite bar and grill among students at Washington State University for hosting sports night during football season, and having seasonal brews and ales to keep the student body happy all year long. Their colorful interior brights up the mood for Coug drinkers. It is also a great place for games, events, and sports packages. With eighteen different brews to choose from, the Coug is the kind of dive that keeps visitors well fed and happy. Out in Providence, Rhode Island is the Grad Center Bar where the academic community of Brown University gets to mingle. The Grad Center Bar is so much a part of the Brown University community that the university website considers it a “resource” on its website. The Grad Center Bar has pool, beer, sports nights, game night, and bar food. The Grad Center Bar is a great dive to relax and play some games while catching up with colleagues and peers after a stressful day at school. The Grad Center Bar is limited to Brown University students and requires a membership that costs $30 per year. Given these restrictions, however, the student body considers it a go-to spot because of its reasonable prices. Unfortunately, RISD students are not allowed. University of Houston’s own Den Campus Pub is home to the Cougars during college football season. They are open seven days a week from 11AM to 2AM and have drink specials from Monday through Sunday. With twelve hours of happy hour per week, students are likely to catch a deal for well drinks or drafts at The Den Campus Pub. They also have game night on Wednesdays, and great “sammiches” for those looking for quality cold cut sandwiches to go with their drinks. The Den Campus has thirty different beers to choose from as well as game night and sports nights. Four Peaks Brewing Company is Arizona State’s special place for excellent selections of craft ale and good. Part of the community since 1996, the Four Peaks brewery offers quality beers and a community atmosphere for relaxation and casual fun. They have different ales for different seasons, and daily happy hour from 2PM to 6PM. There are two locations–Tempe and Scottsdale. Both have great menu items including burgers, desserts from the old creamery and alehouse sandwiches. Four Peaks has 16 different brews to offer. They don’t have live music or Karaoke, but they do show visitors how the local brewery works. They offer sports packages for those who want to see the games that Arizona State University participates in. For the University of Notre Dame campus, the Linebacker Lounge of Indiana is the place to be on Bend Avenue. The Linebacker Lounge, as its title might suggest, is home to great sports package deals, drinks and bar food. For those who are into nostalgic specials, the Linebacker Lounge offers Sloppy Joe sandwiches on Wednesdays with a side of chips. They have a special on well drinks for only $2.75 and pints for $2. They have pitcher deals on Sunday and Monday that don’t go above $6.75 a pitcher. Notre Dame is proudly aware of the Linebacker Lounge and encourages students to check out this local fixture for deals on drinks and food. They have 36 different beers to choose from, as well as game nights and sports events. For Bowling Green State University’s academic community, there’s no better option for food and drinks than Grumpy Dave’s Pub. They host private events and parties, as well as Karaoke night on Fridays. They are open from Monday through Saturday (closed on Sunday) and have at least 10 hours of happy hour per week with twenty different beers to choose from. Their also home to live events, games, trivia, and sports packages. For University of Wisconsin’s community, the Milwaukee Bar Who’s on Third is known for its signature baseball design logo and excellent selection of brews and bar food to create a lasting memory for everyone. They host March Madness events, offer basketball drink specials, and cheese curd discounts. Who’s on Third is also a Milwaukee host to special events and parties. They also have brunch weekends with mimosa and Bloody Mary cocktails. With 28 hours of happy hour per week and at least 30 different beers to choose from, Who’s on Third has all the elements to keep the student community happy. The Moscow Alehouse is home to the University of Idaho’s undergraduate and graduate students seeking food, fun, and casual atmosphere. They have daily specials from Monday through Friday, blending beer, wings, teas, trivia, kegs, faculty and students, and Sunday Bloody Mary cocktails. The Moscow Alehouse is a fixture among the university community members who seek a haven for all the things that matter such as beer and local gatherings. The Moscow Alehouse also hosts live music, raffles, game nights and special events. They have 30 hours of happy hour per week and forty-five different types of brews to choose from. For Idaho students, there’s no better place to be. For students at Mizzou (University of Missouri) in Columbia, MO, the McNally’s Irish Pub is the standard place for sports events, foosball, darks, pool and other games to decompress from midterm’s and final’s weeks. To relieve that stress, they have bar foods like nachos, Guinness cheese dip, onion rings, wings, and spinach-artichoke dip. For those seeking something more substantial and rustic, McNally’s also has strip, ribeye and sirloin steaks on the menu. They have happy hour every day of the week between 4PM and 7PM. They also offer tap for pints and pitchers. For scotch and whiskey lovers, they have different types of single malts available on site. The Dark Horse, also known as, “The World Famous Dark Horse Bar and Grill” is located in Boulder, Colorado and a go-to spot for students at the University of Colorado Boulder and the Naropa University. This landmark bar and grill has been feeding the local college scene since 1975. They have trivia nights, pool table, HD televisions for sports enthusiasts, air hockey, foosball, and video games. The bar menu includes local oysters, salads, sandwiches, wings, burgers and great sides. With 45 different beers to choose from on tap or bottle/cans, the Dark Horse is a special place that has a little something for everyone, even local families for a fun night out. For the University of Texas at Austin students, the Crown and Anchor Pub is adored for its amazing burger and fries deals, as well as its selections of domestic and imported brews ranging from 40 different varieties. Crown and Anchor also offers special deals from Monday through Friday, unlimited throughout the day. On Sundays, they have $3.00 Guinness pint specials that last from open to close. What more could UT Austin students ask for? Crown and Anchor is not only the go-to place for great beers on tap and bottles/cans, but also an excellent spot to scope out the best music. With a 28-year track record, the Crown and Anchor is a Hyde Park favorite fixture. For Southern Californians, the 901 Bar and Grill is the place to be. University of Southern Californians goes to the 901 Bar for its American-Italian fusion bar foods available at affordable prices, as well as their waffle fries. They have happy hour for at least 35 hours a week and thirty different beer selections available on tap and out of the bottle or can. The 901 Bar and Grill also hosts live music, bar games, and events, as well as sports nights for students seeking a package deal. Ohio University’s go-to brewery in Athens, Ohio is Jackie O’s Brewery–the college student’s favorite public house for excellent, on-site brewed beers. The brewery also has a relationship with the local farmers, to offer cart menus from Monday through Saturday, giving liberal educated college thinkers something else to appreciate: the beauty of sustainability and boosting the local economy. Jackie O’s Brewery also has live music. If students have a band, they can book gigs at the brewery directly from the website. For those keg parties at the frat or sorority houses, Jackie O’s Brewery also offers keg pricing. The taproom is available for tours for those looking to learn more about beers beyond just consumption. With on=site greenhouse growing, Jackie O’s expresses its concern for sustainable growing and eating. It also has a bakeshop with select bread and pizzas made from ingredients used at the brewery. Jackie O’s Brewery is truly a thing of beauty. It’s much more than a pub or a tap house. It’s an educational experience that combines food, drinks and fun. Out in Tucson, Arizona is the Schrier’s Sports Grill–a favorite joint among the University of Arizona crowd. It’s the kind of place that has all the fun in one convenient location including bar games, Karaoke night, bar food, drink specials, and sports. Combined with its casual atmosphere and diverse range of appetizers like poutine, veggie burger, spring rolls, pretzels, tacos, pork grilled cheese, and over a dozen other things, Schrier’s makes sure that they’re fully stocked to satisfy any craving. They also have special cocktails for brunch mornings like the classic Bloody Mary, Mimosa, as well as veggie infused vodka and clamato for those looking for a special something. They also have a homemade prickly pear syrup for cocktails out of their fully stocked bar. They have sixteen different selections of beer, package deals for sports nights, and twenty-one hours of happy hour per week. Appalachian State’s favorite pub in Boone, North Carolina is favored by college students for its casual atmosphere and great food selections like tacos, wings, burgers, and fish and chips. They have both pints and pitchers on tap, and up to 40 selections of brews. The TApp Room is quite aware of its college student clientele, so they even offer a buy one, get one 50% off coupon for visitors. What makes the TApp Room unique is also their specials that they have seven days a week. On Sundays, especially, they have what is called a “blueberry pancake shot,” which costs $4.00. It might be worth spending the four bucks just to find out what that’s all about on a Sunday brunch morning. 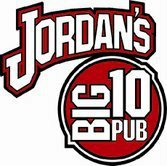 Jordan’s Big 10 is a pub located on Regent Street of Madison, Wisconsin and a favorite among the University of Wisconsin’s students for its famous Friday’s Fish Fry, which includes battered cod, Catfish po’boy sandwiches, grilled salmon, butterfly shrimp, and breaded bluegills that come with a side of soup, salad, potato chips, onion rings, baked potato, potato pancakes or the classic French fries. The prices range between $7.95 to $11.95. They have twenty selections of beer on both tap and from the bottle. Although they don’t offer live entertainment, they do have TV and sports packages for the Wisconsin home team football lovers. Jordan’s Big Ten also has a party room for special events and parties. Quixote’s is a pub that has everything the standard college student at Auburn University would want: good food, decent prices, and drinks. Quixotes Bar and Grill of Auburn, Alabama offers deals like a $5.50 wing platter and $1.00 draft of Bud or Coors to bring in the basketball crowds to root for the home team (War Eagle!). They also have at least two nights of entertainment such as live music or games, and at least ten different types of beers. Their menu items are priced at an average of $8.00, making it an ideal situation for college students who want to enjoy themselves on a budget. With a dollar happy hour pricing with at least twenty-four hours of happy hours a week, it’s no wonder that Quixote’s is a favorite among Auburn students.